T-chip plus seat leon (5f) 2.0 tfsi cupra (265 ps / 195 kw) gasoline chip. This product page has been automatically translated. If you have any questions, do not hesitate to contact us. (5f) seat leon 2.0 tfsi cupra (265 hp / 195 kw) gasoline. For more power for modern engines in real time. Discover our high quality product at an unbeatable price. Latest version of the software. Usually ships in 24 hours. Full right 30 days of withdrawal. A simple and sophisticated adjustment solution for greater efficiency, better engine performance and higher torque. Tuner center, we focus on quality and customer satisfaction. The t-chip plus combines the latest technology with a huge performance increase in your vehicle. Thus, up to 5 parameters are editable at the same time with modern multi channel technology. Thanks to the sophisticated microprocessor to the more t chip. The real-time data of the sensitive sensors are recalculated and sent to the calculator of your vehicle. A number of factors, including the amount of injection, intake pressure, pressure, pressure or air mass, to be optimized on their vehicle outside. 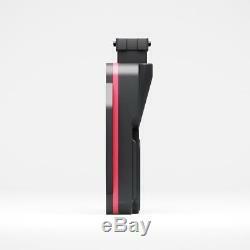 The speed is detected by the t-chip plus via cam shaft sensor or cylinder control. A state of the art, technical interaction, which guarantees your driving pleasure. Simple installation and the highest quality. For our chip no more do not need any specific knowledge in automobile. We provide a simple installation guide by tuner center, after which you can install the device itself. If you still have questions, we are happy to support you on the page. Both cables, like the t-chip plus are made in quality and waterproof delivered. In addition, the chip t plus a heat - and special resistance-resistant plastic stands out with fiberglass reinforcement. 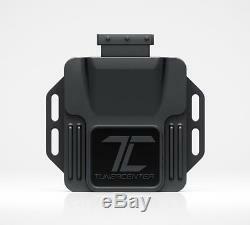 We emphasize tuner center easy management of our best products. Therefore when installing our t-chip as well as chip tuning box completely discarded the use of extra special tools. A simple connection cable between the motor and the box, but also an additional fixing with commercially available clamps is not enough. You do not need any special automotive knowledge for the installation. Enjoy the pleasure of driving. Includes 1 year engine warranty. For us, it is especially exclusive. Because quality and your satisfaction are especially close to the heart, you receive from us a warranty on the engine for all tuner center products. Security is a concern for us. Chip tuning center tuner move only in the herstellerseitigen engine reserves. This prevents possible damage to the washing motor in. Up to 5,000 euros in case of damage. For vehicles up to model year 2013. What is covered by the warranty? The guarantee applies to any damage obviously caused by the use of one of our products. This applies in particular to: engine block, the piston. Connecting rod, crankshaft, crankshaft, intake manifold, engine valves, valve guide, cylinder head, cylinder, housing, ßlwanne, camshaft with camshaft, charger. Software latest version 2017 software parameter software performance parameters can be manually adjusted hardware water repellent board automotive safety cap processor 32 mhz heat-resistant free box t-chip more power wiring harness for your vehicle individual installation instructions original plug fasteners engine warranty form. Via the card & play. We write excellent customer service. For this reason, it is also a concern, we that you install our tuner center quality products can render independently and without the use of special tools. You also need no special knowledge of the automobile. Both the cables, as well as the chip t and t-chip plus are manufactured in waterproof quality and delivered. Also the chip t and t-chip plus heat - and special, acid-resistant plastic stands out with the fiberglass reinforcement. High quality automotive x closure caps. Is my engine through the center of a tuner circuit tuning several claims? By a slightly stronger claimed also automatically the engine components. If you fully exploit the desired power, the engine develops more torque (nm) and power (hp), which increases the stress a bit. An additional charge is created only for the complete motorization. Is this possible despite the increase in production to record fuel and in the affirmative, how? After the integrated t-chip in the vehicle, the fuel savings of 200 ml is possible up to 2.0 liters and can be set earlier on top speed since the torque in the lower turns then significantly higher is found Depend on the values ​​of the characteristics of the respective engine and series tolerance of the vehicle. The majority of our reported customers save more than 100 km of 1.5 l.
Can I use a chip tuning center tuner with Diesel Particulate Filter (DPF)? Our tuning tuning chip center can easily be used in conjunction with a diesel particulate filter (DPF) or soot particle filter. Our modules are designed so that it works well on standard vehicles with dpf. Where should I connect the wire harness? Common rail vehicles offer the connection for the wiring harness usually at the end or in the middle of the common rail. Shorten the life of my engine a chip tuning? The dose that makes the gift? He is fine in this case. As long as no limits are exceeded when a chip tuning and your driving? Is, with no wear should be expected. If you expose the engine through an aggressive driving style constantly high loads, it is negatively completely independent of a chip tuning on your vehicle. Is my vehicle for a chip in focus? In fact, almost all diesel can- and optimize vehicles using the chip focus. Some gasoline engines without have to do. We have a list with âorientation for you? Like, you can send us also a detailed inquiry or personally upon our return to look at? Our engineers will advise you willingly! A special tool is needed for the installation? No, the installation can be done without special tools. In some cases, it may be that the air filter housing needs to be removed beforehand so that the sensor can be reached. For car knowledge to recommend and it is advisable to visit a workshop. Customer technical support message or phone. Receipt of the manufacturer's warranty & return status series: unlike other suppliers, the dismantling of serial status with our quality products without large overhead and additional costs is possible. Once you have fully developed our quality tuner center product (and all connectors according to the original condition were connected), your vehicle again in the state series and again offers standard performance. Based solely on how the vehicle is already back in the state series, after deducing the chip tuning and plug the original attached to the harness. A reading of vehicle storage performance data can provide an indication of (no evidence) to improve performance. These data are only from a few producers in the workshop collected and evaluated separately. If you have described the questions about this, we are with our customer service center at your disposal from the tuner. T-chip, chip t plus, t-booster, t-chiptuning warranty terms and conditions. Chip tuning tuner center, race course route 107a, 67454 haßloch takes over from consumers for t-chip products, chip t plus, t-booster, chip t tuning (hereinafter referred to as chip tuning) this guarantee on the engine. Scope of Warranty - Covered Components and Parts: This warranty is valid for all damage to the following engine components and parts, obviously and exclusively more, debts and obligations t-booster, t chip tuning using our chip t, t- chip: engine block, pistons, connecting rods. Cylinder, cylinder head, crankshaft, crankshaft gear, air-conditioned and equipped with the ßlkreislauf in connection the internal parts, camshaft, camshaft sprocket, intake manifold, engine valves, valve guide, crankcase, ßlwanne, charger. The conditions and the warranty period. The warranty starts with ßbergabe of chip tuning for the customer and is valid for 1 year, for more products t-chip, chip t extra, t-booster, t chip tuning. For products t chip tuning and t-booster warranty 1 year. Up to a total mileage of the vehicle of 200 000 km and provided that. This is the warranty card zusatzsteuergerat closed 14 days after the ßbergabe of the chip tuning completely filled, placing and returned signed on tuner center. The first vehicle registration in ßbergabe of chip tuning for the customer is more than zuruckliegt of five years. No other engine changes or control systems and the vehicle's computer, including improving performance or changing any type of exhaust measures have been made. Restrictions - no guarantee nest. Damages based on vehicle verschleifß. For damages based on this service prescribed by the vehicle manufacturer and maintenance are not distributed. For damage resulting from the fact that the permissible tow mass, or the total permissible weight of the vehicle exceeding vehicles was. For vehicles that are used in motorsport or similar events conducted with competitive or as related ßbungsfahrten. The use of fuel types not shared by engine oils and the vehicle manufacturer will void the warranty. For vehicles with gasoline engines, the warranty claim expires if they were non-nahmslos equipped with fuel of at least 98 octanes. The warranty is transferable to other owners of the vehicle and is not damaged during the installation of the chip developed to the other, that the vehicle is registered in the warranty card. The warranty claim, that is to say entry damaged components of vehicles covered by this warranty and parts (see above) within the warranty period, tuner center shall inform immediately in writing. The written notification of the guarantee must be sent to: tuner center chiptuning racecourse route 107 to 67454 haßloch-germany. With the written notification of the guarantee are required to submit the following documents. Original proof of purchase for the auxiliary control unit. Before the examination of repair or damage are required to obtain the instructions of the tuner center. Is the representative of the center tuner to allow the study of engine damage and to provide all the necessary information to determine damage and information. Is violating these terms and conditions, the warranty will expire. Compensation in case of guarantee center tuner assumes the nachge technically necessary and actually incurred, by introducing a bill - place repair costs for engine components, covered by warranty and parts up to a maximum of? ¬ 5,000 , - by the case of davaria. Legal Rights The legal defaults of the consumer's warranty rights (warranty) against his vendor regarding chip tuning, are not limited by this warranty on the engine. Legal notice compulsory registration for chiptuning in vehicle documents. By chip tuning, the general operating vehicle expires if has been acceptance of installation performance not quickly transported stvzo by a section of i. Officially recognized test facility 19 and confirmed in accordance with § 22, stvzo. Thus, the performance must be entered in the vehicle papers. Notice of corresponding party on the recording of the chip tuning. You can with this party review enter performance on any recognized testing laboratory. An entry in the vehicle papers on an individual license paid by a recognized institute is possible even without certification. Because the exact procedure and costs for a simple case-to-case loss are different, you should consult directly with the appropriate institute criterion on the details of the individual receipt in your case. More details on our tuner center has received the warranty motor insurance here. Installing a tuning chip can affect the insurance coverage of your vehicle under certain circumstances. Please ask for advice before installing your car insurer. For other questions, we have available with our customer service by email or telephone available. The item "t-chip plus seat leon (5f) 2.0 tfsi cupra (265 ps / 195 kw) petrol chip" is for sale since Monday, October 1, 2018. It is in the category "auto, motorcycle parts, accessories" tuning, styling \ motors, chip tuning \ chips, chips ". The seller is "www-tunercenter-de" and is located in haßloch.